Apartment, EG, with 1 bedroom, approx. living space 30 m2, Terrasse, suitable for up to 2 persons. Specialties: Small, modern equipped, sunny studio Price: from 42,00 eur/day. Apartmentanlage, EG, with 1 bedroom, approx. living space 27 m2, Terrasse, suitable for up to 3 persons. Specialties: Swimming pool, directly at the tidal pool, Internet WLAN available Price: from 43,00 eur/day. Apartment, EG, with 1 bedroom, approx. living space 25 m2, Terrasse, suitable for up to 2 persons. Specialties: First line to the Ocean, fantastic sea views, swimming pool, garden, Internet available Price: from 47,00 eur/day. Apartment, EG, with 1 bedroom, approx. living space 30 m2, Terrasse, suitable for up to 2 persons. Specialties: Studio apartment with sea views for a very reasonable price. Internet available Price: from 50,00 eur/day. Apartment, EG, with 1 bedroom, approx. living space 30 m2, Terrasse, suitable for up to 2 persons. Specialties: First line to the Ocean, fantastic sea views, swimming pool, garden, Internet available Price: from 52,00 eur/day. Bungalow, EG, with 2 bedrooms, approx. living space 60 m2, Terrasse, suitable for up to 4 persons. Specialties: Freestanding bungalow with fantastic sea view, Internet davailable Price: from 55,00 eur/day. Bungalow, EG, with 2 bedrooms, approx. living space 60 m2, Terrasse, suitable for up to 4 persons. Specialties: Freestanding bungalow with fenomenal sea views, Internet available Price: from 55,00 eur/day. Apartmentanlage, EG, with 1 bedroom, approx. living space 30 m2, Terrasse, suitable for up to 2 persons. Specialties: Wonderfully situated, with swimming pool, sea views, Internet available Price: from 56,00 eur/day. Apartmentanlage, EG, with 1 bedroom, approx. living space 27 m2, Terrasse, suitable for up to 2 persons. Specialties: First line, sea views, swimming - pool, directly at the tidal pool, Internet available Price: from 56,00 eur/day. Apartmentanlage, EG, with 1 bedroom, approx. living space 30 m2, Terrasse, suitable for up to 2 persons. 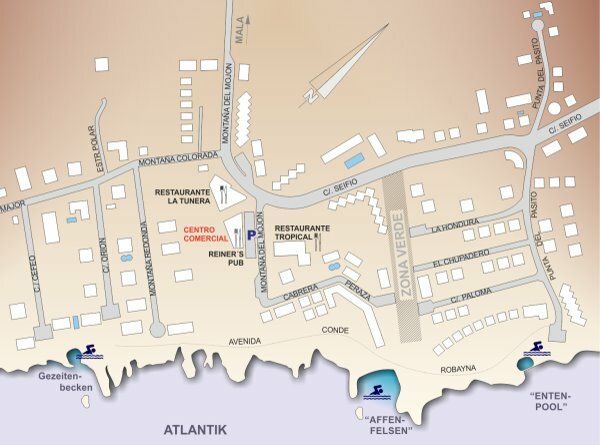 Specialties: Wonderfully situated in the first line to the sea, swimming pool, Internet available Price: from 56,00 eur/day. Apartment, EG, with 1 bedroom, approx. living space 40 m2, Terrasse, suitable for up to 4 persons. Specialties: Nice equiped and reasonable apartment. Internet. Price: from 59,00 eur/day. Haus, EG / OG, with 2 bedrooms, approx. living space 100 m2, Terrasse, suitable for up to 4 persons. Specialties: Very nice and quiet complex with garden and swimming pool, Internet available Price: from 60,00 eur/day. Apartment, EG, with 1 bedroom, approx. living space 45 m2, Terrasse, suitable for up to 2 persons. 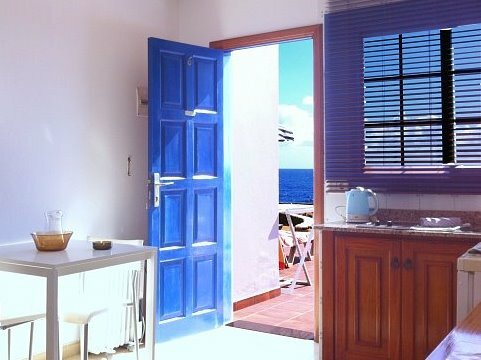 Specialties: beautiful and bright studio with garden and sea views. Internet available Price: from 60,00 eur/day. Apartmentanlage, EG, with 1 bedroom, approx. living space 55 m2, Terrasse, suitable for up to 3 persons. Specialties: Wonderfully situated in the first line to the sea with swimming pool, Internet available Price: from 62,00 eur/day. Haus, EG, with 1 bedroom, approx. living space 50 m2, Terrasse, suitable for up to 2 persons. Specialties: Bungalow in first line to the Ocean with perfect sea views Price: from 65,00 eur/day. Apartmentanlage, EG, with 1 bedroom, approx. living space 55 m2, Terrasse, suitable for up to 2 persons. Specialties: Beautiful and well maintained complex with big pool Price: from 65,00 eur/day. Apartment, OG, with 2 bedrooms, approx. living space 50 m2, Balkon, suitable for up to 4 persons. Specialties: First line to the Ocean, fantastic sea views, swimming pool, garden, Internet available Price: from 67,00 eur/day. Bungalow, EG, with 2 bedrooms, approx. living space 60 m2, Terrasse, suitable for up to 4 persons. Specialties: Newly built house with a small, private pool, Internet Price: from 70,00 eur/day. Bungalow, EG, with 2 bedrooms, approx. living space 55 m2, Terrasse, suitable for up to 4 persons. Specialties: New apartment complex with swimming pool. Internet access via WLAN on request Price: from 79,00 eur/day. Apartment, EG, with 1 bedroom, approx. living space 60 m2, Terrasse, suitable for up to 2 persons. Specialties: Luxury apartment, very nice and big garden, heated swimming pool, non-smokers, Internet. Price: from 80,00 eur/day. Haus, EG, with 3 bedrooms, approx. living space 90 m2, Terrasse, suitable for up to 6 persons. Specialties: Luxury holiday home just a stone's throw from the sea, non-smoker, Internet Price: from 95,00 eur/day. Haus, EG, with 2 bedrooms, approx. living space 85 m2, Terrasse, suitable for up to 4 persons. Specialties: Luxurious property, two houses with a very beautiful garden, Swimming pool, Internet Price: from 135,00 eur/day. Haus, EG / OG, with 3 bedrooms, approx. living space 120 m2, Terrasse, suitable for up to 6 persons. Specialties: Luxurious property, two houses with a very beautiful garden, Swimming pool, Internet Price: from 150,00 eur/day.